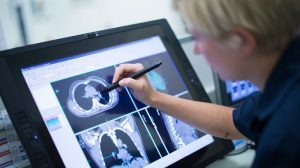 Standard-dose versus high-dose conformal radiotherapy with concurrent and consolidation carboplatin plus paclitaxel with or without cetuximab for patients with stage IIIA or IIIB non-small cell lung cancer (RTOG 0617): a randomised, two-by-two factorial phase 3 study. Does radiation dose escalation above 60 Gray improve cancer control and survival? Does cetuximab synergize with radiation to improve outcomes beyond the benefit of standard carboplatin/taxol chemotherapy? Lead author Dr. Jeffrey Bradley from Washington University will join us. Please follow him on Twitter to keep up with the chat and beyond! We start asynchronous discussion Friday April 17th at 6 AM Central Standard Time with the live chat on Sunday April 19th from 8-9 PM Central Standard Time. non-small cell lung cancer (NSCLC)? T2a: What is the rationale for higher radiation doses above 60 Gy? T3: What were the results of (a) higher radiation dose and (b) adding cetuximab? T4a: What are future directions for improvement on our current standard? T4b: What are safe radiation constraints even at standard radiation doses? Thanks to the generosity of Lancet Oncology and Tamara Lucas, the article will be free and open access from April 15 through the end of the chat. Just register with the Lancet and you can read/download the PDF. Please join us and share what you think! Chemoradiation for Limited Stage Small Cell Lung Cancer: Are You CONVERTed?